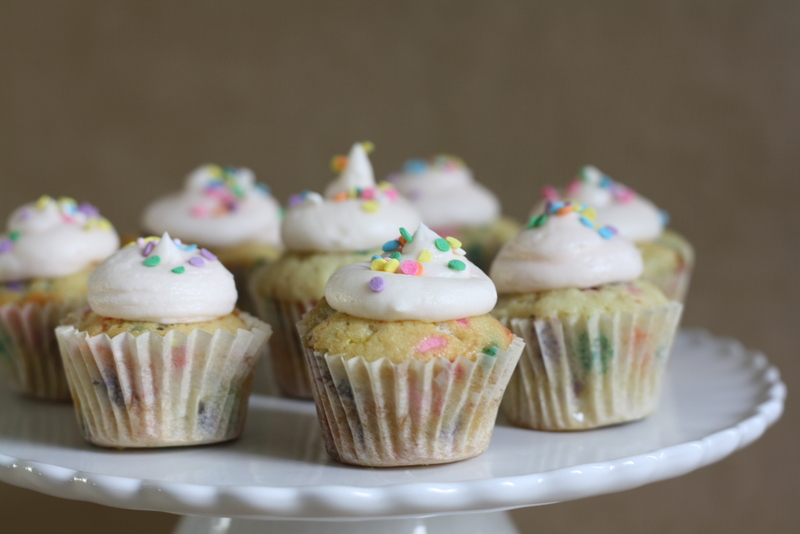 party-sized funfetti cupcakes + the next BMF event! It is a scientific fact that the mini form of anything is just plain better then the larger equivalent. I can’t explain why, when, or how my fascination with mini things began but I can tell you that to this day if presented with a choice I will always without fail choose the mini option. This weekend I spent approximately 95 minutes give-or-take in one of my most favorite stores looking at their collection of mini school supplies and wondering things like: Are mini scissors a necessity? Do I need this small roll of tape? In theory, probably not, but what is one supposed to use to close those tiny envelopes and note cards? Surely full-size tape will not do. What makes mini things even better are sprinkles and I think everyone can agree that we all saw the funfetti craze coming from a mile away (because it is amazing, obviously). Funfetti as a flavor has taken over the Internet of late – funfetti pancakes, funfetti ice cream, funfetti chocolate bark – I can’t go on Pinterest without seeing some sort of funfetti baked good showing up in my feed. Funfetti first came into my life as a cake box flavor way back in the day. It was the ultimate birthday party treat and you were lucky if you could convince your mom to buy the pinnacle of sprinkle success – funfetti cake, funfetti frosting (from a can) and extra sprinkles to go on top. Well little did I know that any vanilla cake turns to funfetti with just a handful of my favorite thing: sprinkles. Because the sprinkles in your baking cabinet are probably having a party right now, these cupcakes are a fitting way to announce an exciting shindig that will be happening soon. Wednesday, March 27 will be the next BAKINGMAKESFRIENDS event! Perhaps you came to the last one and had the best night of your life. If you are unfamiliar - premise is simple. Come to a bar and eat treats. Do you bake? Here is your next excuse to bust out your bundt and bring something! If not, then just come and hang out and we can all eat cupcakes together. I can’t wait to see y’all there. Make the cupcakes: Preheat the oven to 350 and line a mini cupcake with liners. Set aside. 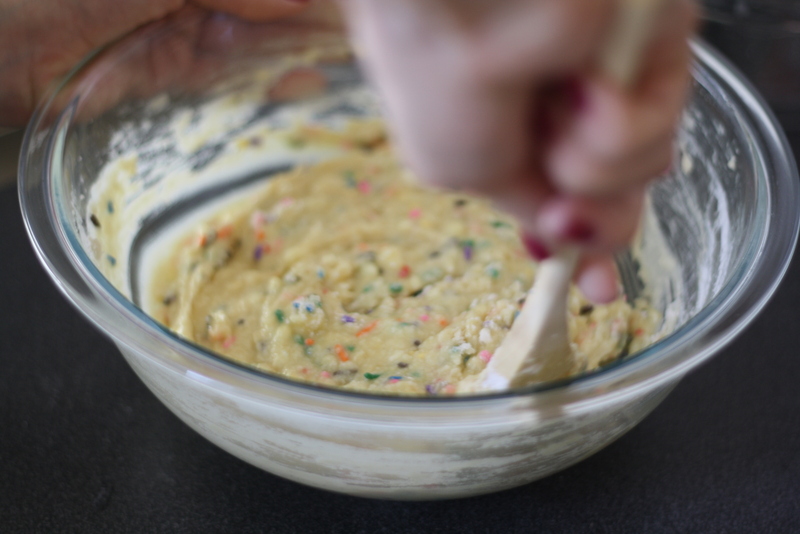 In a medium bowl whisk together flour, baking powder, salt, and sprinkles. Measure out the milk into a liquid measuring cup and add the vanilla. Set both aside. In a large bowl, beat together the butter and sugar until light and fluffy. Add the eggs one at a time, beating well after each addition. Add half the dry ingredients, then the milk/vanilla mixture, then the remaining dry ingredients. Be sure to not over mix. 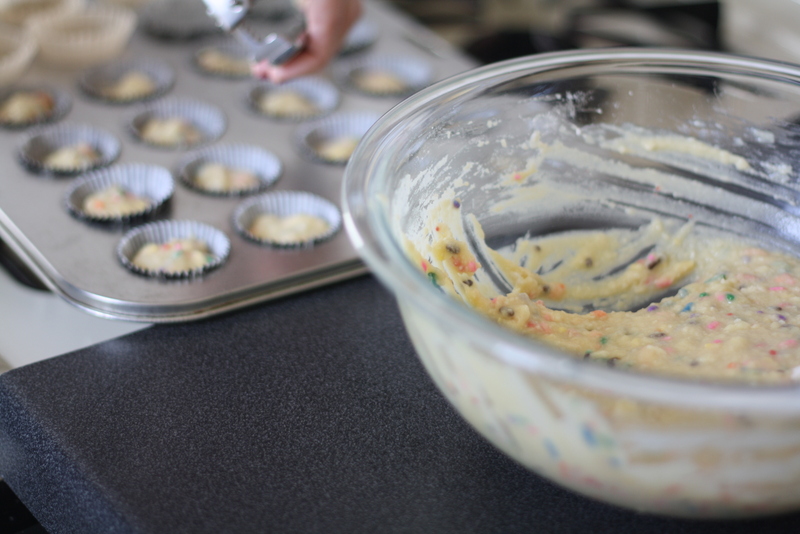 Use a mini scoop (or two spoons) to fill the prepared cupcake tin. You want to fill the cups about two-thirds of the way full. Bake for 15-20 minutes or until a tester comes out clean. Cool cupcakes in the tin for 5 minutes, then transfer to a wire rack and let cool completely. Make the frosting: In a medium bowl, beat together the butter and powdered sugar until combined. Add the vanilla and mix well. Beat in the milk, a tablespoon at a time, until smooth and spreadable. Generously spread the cupcakes with frosting and decorate with the remaining sprinkles. 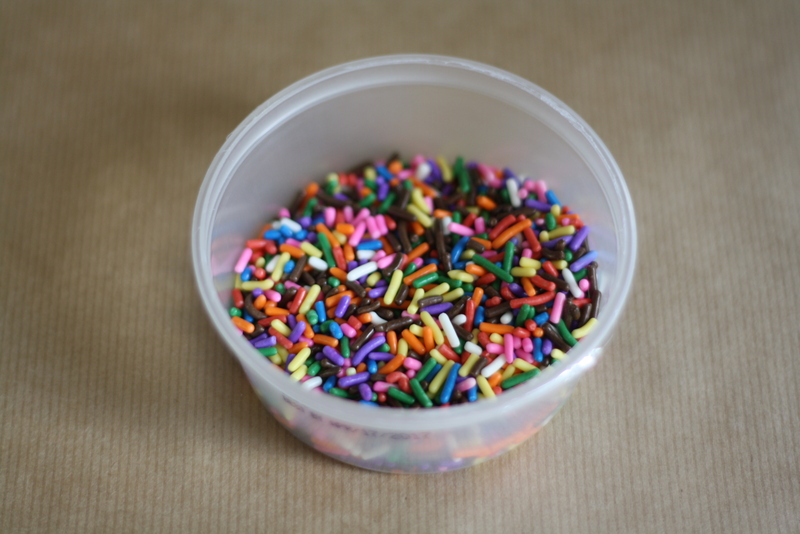 BONUS: Oh hey, did you know that you can color your own sprinkles? 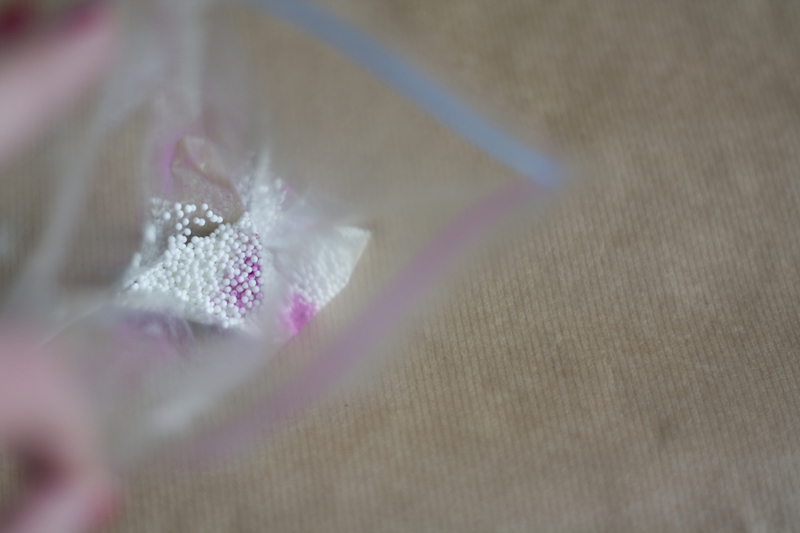 Just shake white sprinkles together with the tiniest bit of food-safe petal dust (powdered food coloring) in a plastic bag. Voila! I agree — tiny things are too cute to pass up, regardless of their practicality (or lack thereof)! You can’t go wrong with cupcakes, though — they’re cute *and* a perfect serving size. And very transportable! I will try to make it out to the event on the 27th, and if I do, I think I will bring some cupcakes! Love these mini cupcakes! Someone needs to make mini grilled cheese…I’m on it! I had no idea, until I read this post, that I need more food coloring. I have liquid and paste in multitudes of colors and several brands. BUT I don’t have petal dust! Custom coloring your own sprinkles sounds like such fun! 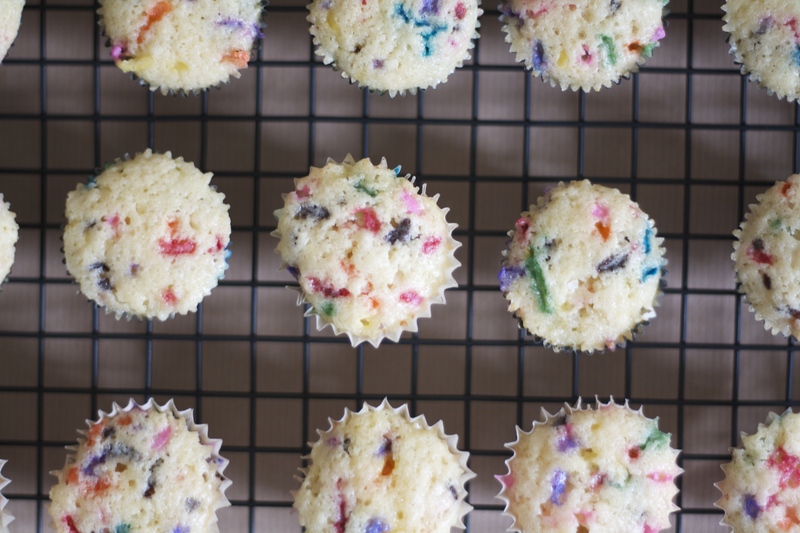 First, I need to use up some of my millions of sprinkles by making these cupcakes. 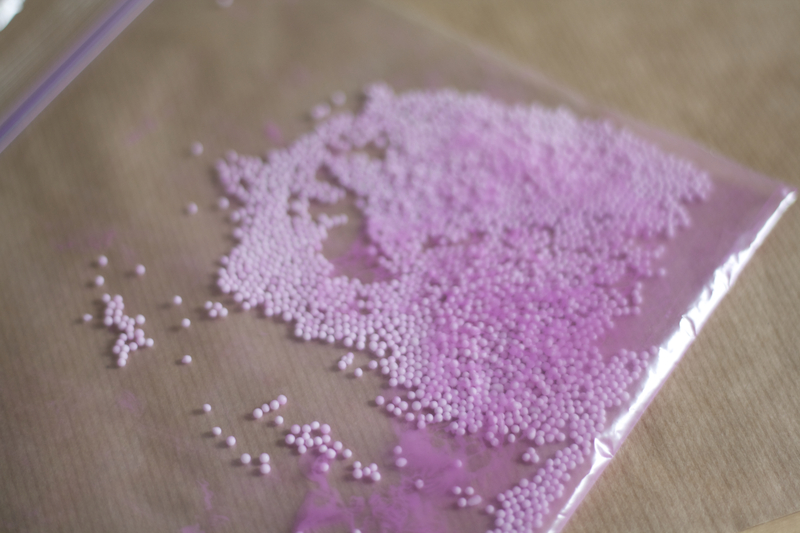 Then I need to go get powdered food coloring and make some more sprinkles! Thank you, Lillie! Haha! Yes, one can never have enough food coloring. The next time you’re in Seattle you need to do a BMF event here! These look easy and fun. Thanks a lot for giving metric measures. Whenever I make cupcakes at home and cover it overnight the top of the cupcake sweats, any ideas to prevent it? Hi Ramya – do you live in a humid environment? 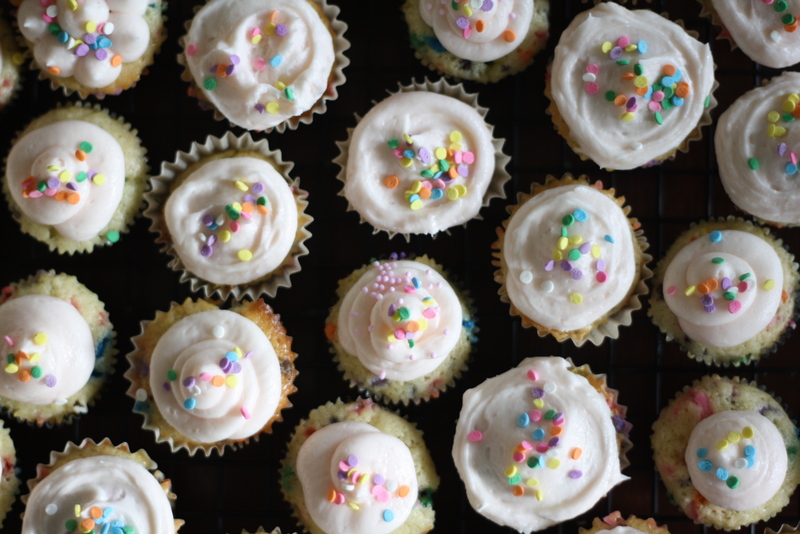 Humidity plays a large factor in why cupcakes “sweat” but to reduce any additional moisture, make sure your cupcakes are completely cool before covering them. Once they are covered, any bit of heat will turn to moisture and cause the tops to sweat. I’m assuming that the cupcakes are unfrosted? You may want to frost them and then cover them, since the frosting will help to seal the tops of the cake. In the summer when my kitchen is a bit more humid, I usually cover my cupcakes with a cardboard box. 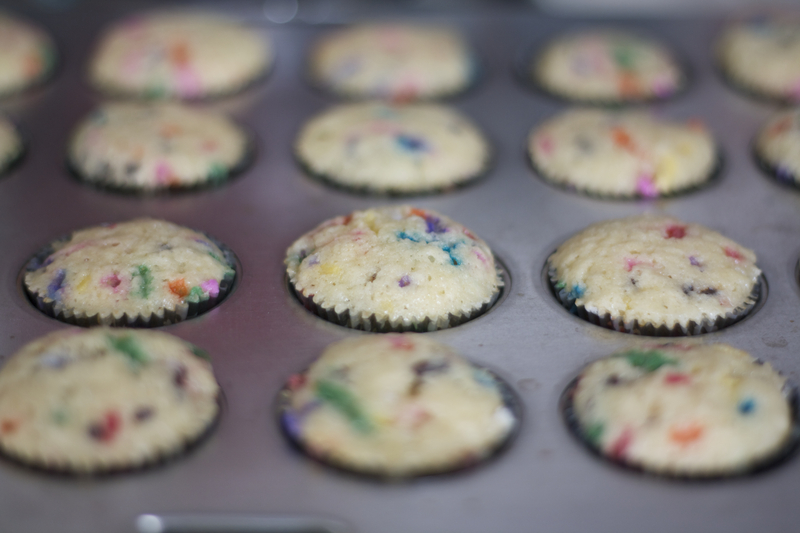 It allows for the cupcakes to “breathe” more than a sealed tupperware container and usually reduces the sweating a bit. Hope this helps! Happy baking! I love these funfetti cupcakes !!! What an ‘Allure’ they have…! And, I totally agree, things ( cupcakes, boxes, perfumes, chocolates, dolls, candies and and and…) are much more beautiful and lovely if they are small-sized. I’m a big fan of your sense of colours, shapes and beauty! Just made these for my sons 1st birthday! Very excited. Can the frosting be made ahead of time and refrigerated?